Brillante Mendoza and Joseph Estrada will be featured in separate documentaries that will be aired on CNN International this October. 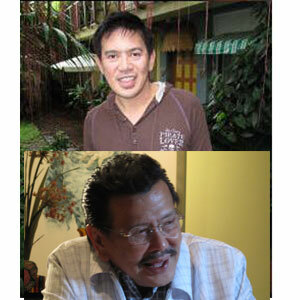 Direk Brillante will talk about his triumph in Cannes while Erap will talk about his upcoming movie. Filipino filmmaker Brillante Mendoza and ex-President Joseph Estrada will be featured in separate episodes of Scene by Scene—Films of Asia Pacific. The documentaries will be aired on CNN International this October. Hosted by CNN's Anna Coren, the four 30-minute documentaries celebrate the cultural diversity and outstanding quality of the films being produced in the region. Direk Dante (Brillante's nickname) caught the attention of CNN when he won as Best Director in the 2009 Cannes Film Fest for his film Kinatay. Scene by Scene takes a look at the Philippines' thriving independent filmmaking scene and speaks to the director shortly after his Cannes win about being at the forefront of the Filipino new wave. Aside from being featured on Scene by Scene, Direk Dante was also featured on CNN's Talk Asia, which was aired last August. This episode will be aired on October 11 (12:30am & 7pm) and on October 12 (2:30am & 10am). Meanwhile, Erap was interviewed by CNN on the set of his upcoming Star Cinema film Ang Tanging Pamilya. He is cast as the father of Toni Gonzaga and he acts opposite comedienne Ai-Ai delas Alas. Sam Milby plays the Fil-Am boyfriend of Toni's character. "Removed from office in a bloodless coup amidst massive protests in 2001, former Philippine president Joseph Estrada, once an action movie star, returns this year to the big screen with his first film since his ousting over allegations of incompetence and corruption. Estrada starred in 120 movies in a 26 year acting career and used film as a launching pad for his political ambitions. 'Scene by Scene' visits Estrada on the set of his new comedy where he plays a minibus driver trying to deal with his daughter's plans to marry her Filipino-American boyfriend. At 72 years of age, Estrada is poised for a star comeback—in both film and politics." The episode featuring Erap will be aired on October 17 (9:30 pm) and October 18 (3:30am & 4:30 pm). This series of documentaries is released to drum up excitement for the 2009 Asia Pacific Screen Awards. In last year's edition, the Nora Aunor-starrer Himala was chosen as the Best Asia Pacific Film of all Times through an online poll.